Numerous realities suggest caution is warranted when it comes to Sharif’s capacity for reform. Pakistan’s parliamentary elections on May 11 this year were a historic landmark in the nation’s democratic evolution. 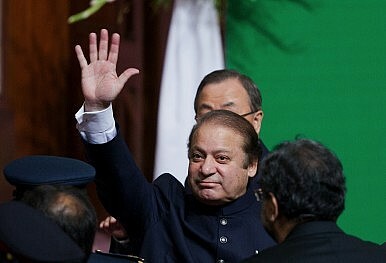 For the first time in Pakistan’s 67-year history, power was passed peacefully from one elected government to another. The decisive election of conservative party leader Nawaz Sharif as prime minister was also a welcome end to five years of feckless and corrupt leadership by Asif Ali Zardari, widower of Benazir Bhutto. The relief felt internationally after the elections has been reflected in a number of articles and public pronouncements by Pakistanis and foreigners alike expressing optimism about the benefits that five years of Sharif’s leadership could bring to his troubled nation of 180-plus million Muslims. Wishful thinking apart, what are the prospects that Sharif’s third term as prime minister will reverse Pakistan’s alarming decline in recent years toward economic and political failure? This writer witnessed, as Pakistan Desk Officer in the State Department, how high hopes in Washington for Sharif’s first term (1990-93) were disappointed and finally dashed by his authoritarianism, mismanagement, provincial favoritism, Islamism, and corruption. His second term as prime minister suffered from many of the same failings, but was weakened and finally undone by ill-advised confrontations with the judiciary and military establishment. It is possible, of course, that 14 years of exile have made him the “kinder, gentler statesman” that some commentators aver. Others point out that Pakistan has changed since Sharif was pushed from power by the military in 1999. They argue that an activist judiciary, invigorated parliament, and robust media serve as counterbalances to executive power and forces for greater accountability. On the other hand, Pakistan’s feudal power structure remains fundamentally intact, and the deterioration of Pakistan’s economy and domestic security poses enormous challenges to leadership. If Sharif has learned any lesson from his previous two stints as prime minister, it should be that his chances for serving a full five-year term in office will depend on his establishing a modus vivendi with Pakistan’s powerful military establishment. His prospects for establishing civilian control over the military and intelligence agencies, however desirable in theory, will probably prove as dismal in this third term as they were in his first and second. The military, on the other hand, apparently have learned from the presidency of Gen. Pervez Musharraf (2001- 2008) the risks (Musharraf is now in detention, awaiting trial) of assuming direct control of the state rather than defending their corporate interests and calling the shots on major national security issues from behind a screen of civilian leadership. What this means for Sharif is that he can expect the military to afford him considerable latitude in politics and civilian governance provided that he accepts the military’s control—including veto power—over such critical areas of security policy as Pakistan’s relations with India, Afghanistan and the U.S. In 1999, Sharif had not learned these lessons. That year he led a historic push for détente with India by meeting with his Indian counterpart and signing with him a joint communiqué known as the Lahore Declaration. This reaffirmed the commitment of the two neighbors to resolve their dispute over Jammu and Kashmir peacefully. Unfortunately, the military establishment remained firm in its belief that opposition to India’s control of most of Kashmir and to India’s heavy-handed suppression of rebellion among Kashmiri Muslims was a core national cause and a rationale for the resources commanded by the Pakistani armed forces. Within months of the Lahore Declaration, Pakistani troops had crossed the Line of Control (LOC) at Kargil in northern Kashmir and were fighting Indian troops, thereby igniting a short but bloody conflict that reversed whatever positive momentum had been achieved in bilateral relations. There is credible evidence that the prime minister had no clear understanding of his army’s intent to launch the unprovoked cross-border offensive. A subsequent power struggle between Sharif and Chief of Army Staff Musharraf, an architect of the ill-fated Kargil campaign, led to Sharif’s ouster by the general. Why can’t Islamabad get its foreign policy on track? The EU can carve out its own position vis-a-vis the United States and China.